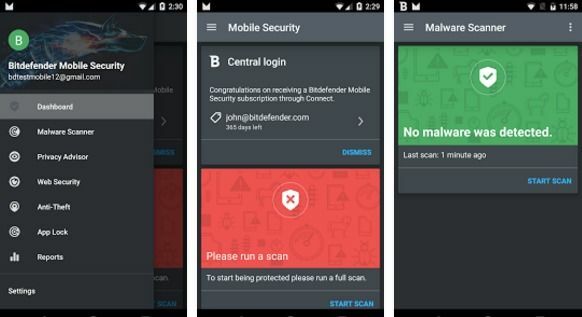 Ge a FREE license key of Bitdefender Mobile Security & Antivirus for a limited time only! This tool protects your Android smartphone or tablet from malware and viruses, plus has other features such as privacy protection, app lock, web security, and anti-theft. Malware Scanner – With an independently proven 100% detection rate, Malware Scanner is always up to date with the latest intel on viruses and automatically scans apps for malware as you install them. You can also scan for malware manually at any time. Privacy Advisor – Find out if any of your apps peek into your private data and leak it online. Privacy Advisor also tells you when apps access the Internet without your knowledge and download unwanted data. App Lock – Use App Lock to easily set up a PIN code for any app so you remain the only one who opens them. Smart Unlock – Make your life less complicated. When you’re using a trusted Wi-fi network such as your home hub, Smart Unlock grants you direct access to your apps by disabling the PIN code. Web Security – Whether you’re using Android’s default browser or Chrome, Web Security detects malicious content and keeps your browsing safe. Anti-Theft – Lock, geo-locate, sound an alarm, and wipe your Android from any Internet connected device. Anti-Theft even allows you to listen in on your phone, and send out SMS commands. It will also alert you in case the SIM card has been changed. Snap Photo – Active defense against thieves and intruders: your phone will snap a mugshot of any person who tries to tamper with your phone in your absence. WearON – cybersecurity for smart watches – Bitdefender Mobile Security also protects any Android Wear devices connected to your smartphone (Android 4.3 and up required). With Phone Alert your smart watch will vibrate when you step too far away from your main device. Use the Scream function to ping your phone, and it will scream for you even if you left it on silent. Visit this giveaway page, register with your email to get a free license key for 6 months of Bitdefender Mobile Security & Antivirus. Hey ! TechTipLib I couldn’t get the license key from my side. As the page shows ERROR msg. If u don’ t Mind could you please generate a license key and deliver the key via my mail ID. I am in need of a genuine license ASAP. I’ve registered a license key to your email, check your email for the key.